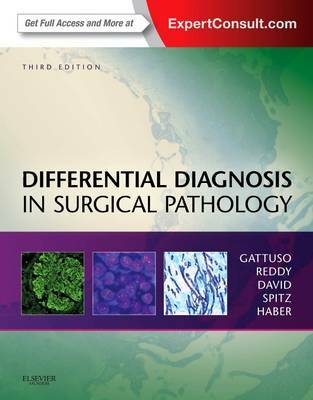 Differential Diagnosis in Surgical Pathology, 2nd Edition, by Paolo Gattuso, MD, Vijaya B. Reddy, MD, Odile David, MD, and Daniel J. Spitz, MD, is skillfully designed to help you confidently sign out your most complex and challenging cases. Covering a complete range of tumors and tumor-like conditions in all organ systems, it provides a user-friendly road map to the main criteria you should consider in order to differentiate between a variety of potential diagnoses that all have a very similar appearance. Over 1,350 new full-color macro- and microphotographs provide a realistic basis for comparison to what you see under the microscope. Quick checklists cover all diagnostic possibilities to make sure nothing falls through the cracks. Full-text online access at expertconsult.com allows you to reference the book from any computer and download all of its images. Quickly access essential information through concise, bulleted text; a consistent approach to diagnosis and interpretation; and a comprehensive yet manageable size. Formulate an accurate diagnosis with coverage of all of the relevant ancillary diagnostic techniques, and ensure every diagnostic possibility is explored with help from quick checklists throughout. Make informed decisions when delineating one disease from another with discussions covering all of the major organ systems. Understand what diagnostic criteria to consider or exclude with expert "pearls" and practical tips throughout. Take advantage of extensive updates on tumor classifications and diseases, as well as expanded coverage of medical renal pathology. Stay abreast of the latest developments in molecular testing, including diagnostics, biomarkers, and targeted therapies, for entities such as the breast, lung, gastrointestinal tract, and melanoma. View over 1,350 full-color macro and microphotographs that provide a realistic basis for comparison to what you see under the microscope. Expert Consult eBook version included with purchase. This enhanced eBook experience allows you to search all of the text, figures, references, and videos from the book on a variety of devices. Your purchase entitles you to access the web site until the next edition is published, or until the current edition is no longer offered for sale by Elsevier, whichever occurs first. Elsevier reserves the right to offer a suitable replacement product (such as a downloadable or CD-ROM-based electronic version) should access to the web site be discontinued. "The style and content of this book make it a must-have for students and residents in pathology. It compresses large amounts of data into a concise, easy-to-read format that includes the most pertinent information for each entity. This book offers a comprehensive differential diagnosis list for every entity and subsequently compares them, which is what has made it such a popular book." -Drew D Nedved, MD (University of Kansas Medical Center) Doody Score: 90 - 4 Stars!